The early onset of dog laryngeal paralysis symptoms is something that is often not readily noticed by dog owners and this can cause delays in seeking veterinary diagnosis and treatment. Knowledge is power when it comes to recognizing certain medical conditions in dogs, therefore it’s important for dog owners to be attentive and avoid chalking up certain symptoms to the dog’s normal aging process or the weather being hot. Following is some information on canine laryngeal paralysis and dog laryngeal paralysis symptoms that dog owners should be watchful for. Laryngeal paralysis in dogs is a condition where the nerves and muscles responsible for controlling the movements of the arytenoid cartilages of the larynx stop functioning as they should. In a normal, healthy dog the arytenoid cartilages of the larynx will open when the dog inhales and close when the dog swallows during eating and drinking so to protect the airway and prevent choking. In a dog suffering from laryngeal paralysis, on the other hand, the arytenoid cartilages become flaccid, collapse and therefore cease to function as they should. This results in a variety of problems in the affected dog including not receiving sufficient airflow during exercise, problems with heat tolerance and problems with swallowing. In dogs laryngeal paralysis can be unilateral or bilateral. 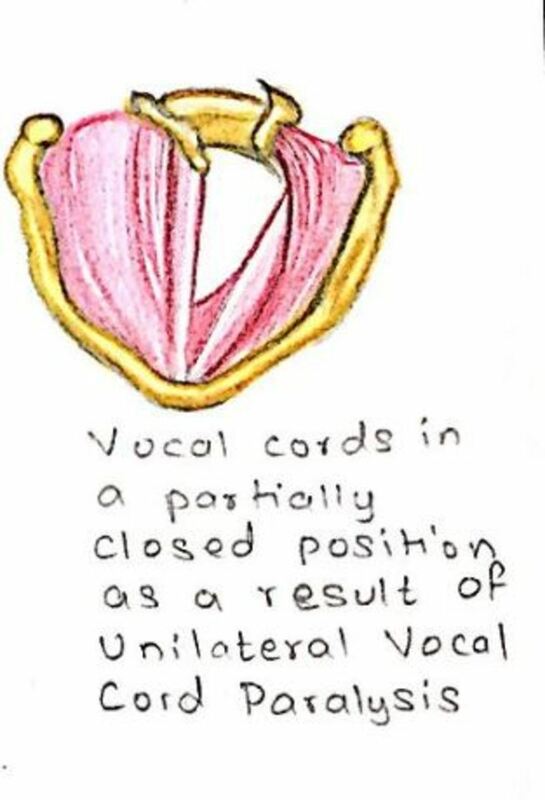 The picture of the left shows unilateral vocal paralysis. Laryngeal paralysis can be diagnosed through a test known as dog laryngoscopy. There are also two forms of laryngeal paralysis in dogs: congenital or acquired. The congenital form is hereditary and symptoms start at an early age generally before the dog is one year old. The acquired form instead appears in geriatric, medium-to-large breed dogs, especially Labrador retrievers. The age of onset is generally after age 10. Male dogs are estimated to be about three times more predisposed than female dogs. Regardless of the type (congenital or acquired) affected dogs develop similar dog laryngeal paralysis symptoms. Dog laryngeal paralysis causes a variety of distinct symptoms, but some might not be recognized at their early onset. The progression of symptoms is often quite slow and months to years may pass before dog owners notice that their dog is suffering from severe respiratory distress, explains board-certified veterinary surgeon Dr. Eric Monnet. The most evident symptoms of laryngeal paralysis in dogs are the result of progressive failure of the correct functioning of the dog’s laryngeal muscles. One of the first dog laryngeal paralysis symptoms dog owners may notice is that a dog’s barking may sound different. Dog owners often report that the dog’s bark has become hoarse. The medical term for such voice change is dysphonia. This dog laryngeal paralysis symptom is often ignored as owners may think that a dog’s voice changes as dogs get older. However, hoarseness in dogs is not something that happens with age. Unless the affected dogs has been barking a whole lot, one should consider that dogs don’t get “laryngitis” as people do. Instead, when a dog’s barking changes, this is indicative that something must have altered the way the dog’s vocal cords are working, explains veterinarian Dr. Lucy. As the condition is allowed to progress, the affected dog will start feeling more fatigue when engaging in activities. Dog owners may attribute this to simply old age or simple tiring from achy joints. It’s important though to see the vet at these first signs. If a dog with complete laryngeal paralysis is allowed to engage in strenuous exercise, this could be dangerous and may potentially cause severe upper airway obstruction which may lead to a dog suddenly collapsing. Because dogs with laryngeal paralysis have a limited ability to cool themselves down by panting, they are more susceptible to heat associated problems such as heat stroke. Dog owners living in a hot or humid area are most likely to notice significant signs of heat intolerance in their dogs, but they are likely noticed as well by dog owners living in milder places during warmer months such as late spring and summer. What happens exactly in this case is that this condition interferes with a dog’s ability to pant because affected dogs are unable to fully open their trachea so to pass air for cooling purposes, explains veterinarian Dr. Amanda. Since the nerves and muscles of the dog’s larynx no longer work well in preventing aspiration of food and liquid, a dog who starts coughing, gagging or choking when eating or drinking should be a red flag. The medical term for difficulty swallowing is dysfagia. In dogs with laryngeal paralysis, when they swallow, their airway is not protected meaning that food/water can go down into the lungs and this may ultimately cause aspiration pneumonia. Typically, dogs with laryngeal paralysis manifest some type of labored breathing. One common occurrence is the dog appearing to produce noise when breathing in, particularly when panting. Some dog owners report it sounds like a “roaring sound” or that the dog ‘s breathing has become “raspy.” It’s quite easy for dog owners to miss these subtle changes, only until they become more evident. Some dog owners report that their dogs appear as if they are “smiling” when they pant because the trouble breathing causes them to pull their lips way back with the tongue sticking out. What causes trouble breathing in dogs with laryngeal paralysis? This happens because the dog’s airway is narrower than normal and this once again occurs because the muscles of the dog’s larynx are not opening the larynx as they should, further explains Dr. Lucy. Finally, the stridor produced in a dog suffering from laryngeal paralysis can be quite distinct and can often be heard from a distance. It is often more pronounced when the dog is panting because of being excited or after having exercised. Dog owners often describe it as a high pitched sound upon inspiration or simply a harsh breathing noise. The stridor, just as in the case of trouble breathing, is caused caused by narrowing of the passage through the larynx. Please note: the above list of dog laryngeal paralysis symptoms and videos are not meant to be used as a diagnostic tool. Also, consider that some of the above videos are of dogs with severe signs. Just becuase your dog doesn’t show such evident signs, it doesn’t mean he doesn’t have laryngeal paralysis, he may still have it but it may be an early onset or he may have another condition that warrants veterinary investigation. Please see your vet if you suspect your dog has laryngeal paralysis for proper diagnosis and treatment.